TNNA was just as much fun as I imagined it to be, maybe even more! I had to take little LG with me, which is not exactly something I would advise (brining a baby to TNNA) however it is allowed, and I can tell you I am extremely happy I went, and at this juncture I simply could not have gone without her. Next year however, margarita’s on me, because I’ll be coming alone! Everyone was so kind about having the baby along, I am going to attempt to thank a few of the people who helped me with her, allthough I am sure I’ll miss a few. First and foremost thank you to Allegra for wearing her and watching her many times. Thank you to Kate for wearing her while we went off the interview Debbie Bliss, I really didn’t want to miss that opportunity! Thank you to Theresa for entertaining the baby and Stefanie for the moral support, and thank you to everyone else who smiled at her or offered to hold her (despite the fact she wouldn’t let anyone!). Just a few of the people I got to meet in person (finally!) Boone Marie Burns, Stefanie Japel, Marly Bird, Olga (Olgajazzy), Melynda (FrenchPressKnits) Debbie Bliss, Amy Singer, Ysolda, and about 500 other people!!! Everyone was so amazing, and so nice. I am just all filled up with goodness from the knit/crochet community. Oh wait, how can I forget about Amy Butler, who was just about the sweetest person ever. She has a new line of yarns out that are amazing, and don’t forget about her wonderful fabric (how could you?). I keep thinking of more names, it’s insane crazy how many talented and wonderful people are at TNNA, it’s an amazing opportunity so many thanks to TNNA for putting together such a great show, and how fun was the @hellotnna twitter stream (from the ever wonderful Ravelry team). 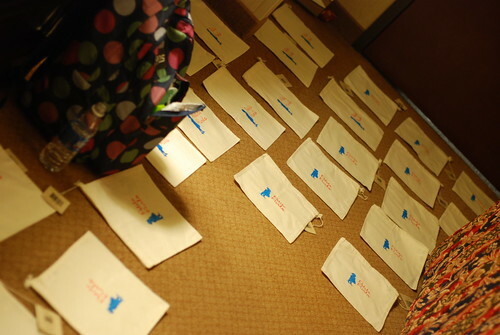 The first night we stayed up until the wee hours of the morning print screening some project bags to give away on the show room floor. I have a print Gocco and I burnt a screen and brought it with me, along with ink and a cloth stamping kit. Allegra and I met for the first time EVER, and that of course was amazing, in many ways it felt totally normal like we have been buddies forever. I guess all those late night phone calls and google-chats can do that to you! I am flat out exhausted, and sad I never had any ice cream, but there will always be next year. Now off I go, to code up the last bits of the Petite Purls summer edition. I remember those days when the baby just had to come along with me to places that first year. It was amazing how many people helped out – and were happy to do so. I have to admitt that the next year when I had more freedom it WAS nice, but I did feel like something was missing! Glad you had a great TNNA experience! It sounded wonderful. Rowan is precious and I enjoyed being able to hang with her. But I am already getting excited about Margaritas on you 🙂 Can I pre-rain-check mine at SAFF? LOL! Gorgeous! I want some just about 3 or 4 inches leognr. Beautiful yarn. I don’t understand how anyone puts together an actual pattern. I find following a pattern challenging enough. You never cease to amaze me.